It mightn't quite be living the dream, but I was sitting in the restaurant at a Tokyo hotel around six-thirty last night thinking life doesn't get much better than this. I was wrapping up a plate of pasta alla vongole bianco, with accompanying glass of prosecco, having wandered back from Tokyo's best oyster bar, and a glass of Yebisu that washed down four prime examples of Japan's best oysters. 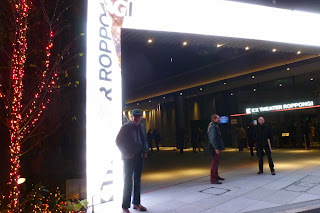 And it was time to head out the door for the second of three Elvis Costello Spinning Songbook shows at a theatre a matter of a couple of hundred metres down Roppongi Street. No, it doesn't get much better than this, but, occasionally it does. Not much better, and again, the unexpected lift came in the encores where last night's performance produced a Hammer of Song request for Church Underground, a response that this band doesn't know that song and a decision to do it solo. This time around, an excursion into the crowd during the Help Me segue out of Watching the Detectives produced what looked like an awestruck high school girl who needed assistance from The Mysterious Josephine to ring the bell. I might be wrong about the high school girl, and awestruck might be wide of the mark as well, but the key point here is that she didn't look like someone who'd be conversant with the depths of Mr Costello's extensive back catalogue. The request? Having managed, with assistance, to ring the bell, she asked for The Imposter, and followed it with the news that the request was for my lover because it's his favourite song. Cue stunned looks all round from an outfit that takes its name from the song. An on-line query when I made it back to the hotel room reveals the song was last played in May 2008. So, five and a half years is plenty of time to forget how it goes. One suspects there's an autocue in operation, and they needed a window to enter the data. A final spin of the wheel produced an Imperial Chocolate bonus (Poor Napoleon, Shabby Doll). With The Imposter and Sugar Won't Work to follow it was a great way to wind up what had been another excellent show. Significantly, Elvis left the stage with a remark along the lines of See you tomorrow night. It'll be on television. We'll all be famous. On that basis, you'd have to see these two shows as trial runs for a concert that's going to go live to air from seven-thirty this evening, so one's inclined to filter the last two nights through that perspective and make a few predictions. There's no doubt about the opening Overture, the four or five song blast that had Uncomplicated slotted in the middle of I Hope You're Happy Now, Heart of the City, Mystery Dance and Radio Radio. It's also fairly obvious he's working towards a particular demographic when it comes to the wheel spinners. They tend to be young, female and almost invariably overwhelmed by the fact that they're up there on stage in front of all those people. I was hoping that he'd grab one of the geekier types I spotted in the foyer, which might have produced some interesting results, but in this setting the star of the show probably doesn't want to be upstaged. The first spin produced the Girl bonus (This Year's Girl, Party Girl, Girls Talk, and the Lennon-Macartney Girl), and the next two delivered She, with comments about the original French lyric by Charles Aznavour, and Monkey to Man, followed by an impromptu Tokyo Storm Warning and Alison > The Wind Cries Mary > Somewhere Over the Rainbow > There's A Place For Us. We know they're impromptu because that's how they're tagged in the official set list. For me, things really took off with the next spin, God Give Me Strength, complete with masterful piano from Mr Nieve and a venture out into the audience for the final verse or two. One of my favourite Elvis songs, delivered with total passion. That was the first of a double spin, with the second selection, Accidents Will Happen deferred until after Spin 6, which threw up Tokyo Storm Warning. The respin added New Lace Sleeves to the set list. I thought we were in for the first encore break after Accidents, but Wise Up Ghost and I Don't Want To Go To Chelsea rounded things off nicely, and the crowd reaction, while not as restrained as the previous night, made me suspect we were in for what amounted to a second set rather than a string of encores, particularly when the next cluster of songs concluded with Peace Love & Understanding. In between the guitar action centred around the acoustic with Ascension Day followed by Good Year For the Roses, Suit of Lights, Slow Drag for Josephine, Jimmie Standing In The Rain and a quite magnificent Shipbuilding. The young gentleman who'd been hauled up on stage for the double spin had named it as his request, missed getting it by a whisker (Accidents lobbed instead) but ended up having the wish fulfilled. This acoustic based set based around Josephine and Jimmie seems to be standard operating practice, so you can probably pencil it in for tonight's show as well. Viceroys Row and Oliver's Army preceded PLU, and raised the suspicion that we weren't going any further. Elvis looked at his watch towards the end of the latter, obviously checking how long they had before the curfew or scheduled end of show. And based on the degree of audience response you mightn't have been surprised to see the house lights come on at that stage. I was mildly surprised to note two gentlemen in front of me who had been applauding enthusiastically throughout sitting back and conversing as if the next bracket of songs was a foregone conclusion. Well, it probably was, but I thought that part of the game was to act as if the second, third, fourth and fifth encores are the result of crowd appreciation. The appearance of someone coming up to replace Elvis' drink container as soon as the band departs the stage is, of course, a dead set give away. Maybe he needs to wait until Elvis and company return. Surely he can skirt around Davey on his way to the little riser that holds Mr Costello's vocal lubrication. But that's a minor gripe. The return that was always on once you saw the refill started with Watching the Detectives, which morphed into Help Me with another foray into the crowd that brought the young lady up on stage for the Hammer of Song and the request for The Imposter. The convenient fiction of needing time to remember how it goes produced a final spin, and an Imperial Chocolate bonus, which turned out very tasty indeed. Poor Napoleon, Shabby Doll and The Imposter, followed by Sugar Won't Work brought things to a close in a show that, for once, didn't end with Pump It Up. I can't say I was disappointed by the omission. Viewed as a whole, a step up from Wednesday night, with the promise of something extra special with the live to air TV tonight. It says something about Costello's ambition to take a fly by the seat of the pants thing like a Spinning Songbook show and go live to air on a major pay TV network. With two practice runs under the belt, tonight's show threatens to pull out all the plugs if he can wangle the right participants for the Wheel segments. Hammer of Song request for The Imposter resulted in baffled looks all around and another spin while Elvis "tried to remember how it went." Parting remark along the lines of See you tomorrow night. It'll be on television. we'll all be famous.